High-quality/ Waterproof/ Easy to use High-grade polyester waterproof fabrics,Feels like cotton,Thick lining is not easy to deform, Color and lustre is exquisite, Texture, perception is more upscale, Smooth zipper structure,Easy maintenance. Multi-purpose This pouch bag not only can be used for stationery storage, but also suitable for your cosmetic,keys,cash,coins,stickers,headsets,etc. It can help you collect all the little things and make your life less cluttered. Stylish design/ Multi-color options Compact and lightweight design,Very artistic,Chic and stylish, Never goes out of fashion.Very simple but elegant lovely color, Many colors available, Texture and handiwork is top-notch. Money back guarantee For any reason you are not satisfied with this pencil bags please let us know and we'll instantly refund 100% of your money. 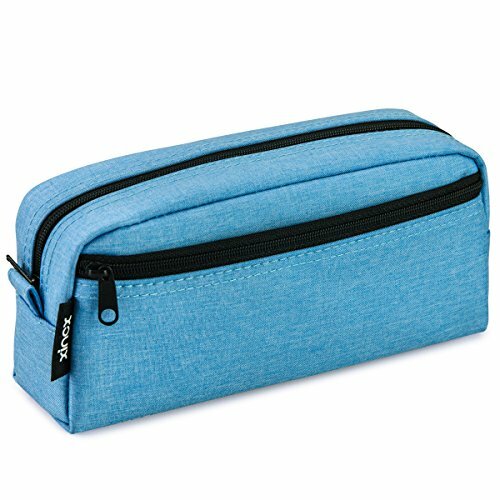 This is a portable multi-purpose high-quality Big Capacity Pencil Case.Convenient and light,Sturdy and durable!Simple yet classy designFashionable and practical! Big Capacity, you can install pencils, erasers, rulers, etc. As a cosmetic bag, you can hold lipstick, eyebrow pencil, makeup brush, etc. Also suitable for your keys,cash,coins,stickers,headsets,and other small items and make your life more organized. Exquisite gift to your kids or friends and yourself.